How can I install applications to my M-Series Smart Glasses? The most common reason for applications not updating is the M-Series device is configured with communication to the Vuzix App Store disabled. To check this from the M-Series, navigate to Settings > App Manager. 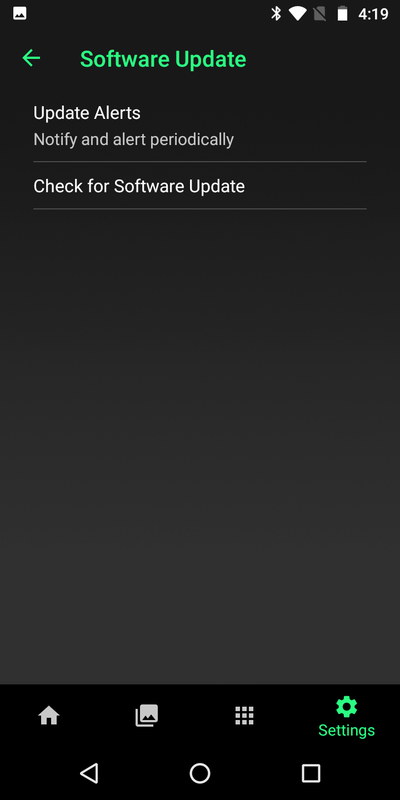 The App Manager toggle switch must be enabled to communicate. Once the App Manager is toggled, it may fail with the error “App Store connection refused. Is this device properly registered on the app store?” The switch will again appear in the off position. To correct this, follow the "Linking to App Store Account" section below, then repeat this configuration step. Once enabling the App Manager is successful, please be sure the M-Series device is configured to “Run Actions Automatically” and to “Check for Updates Periodically”. This will keep the device synchronized with the latest updates from the Vuzix App Store, preventing future problems. Click “Check for Pending Actions Now” and the M-Series device will begin downloading and installing any applications that are out of date. If the device configuration did not solve the problem, the last step is to verify the device status within the Vuzix App Store. Determine the serial number of your M-Series device before continuing. The serial number is printed on the outside plastic of the M-Series device. Please be careful to read this from the main M-Series unit, not the battery. It may be easier to read the serial number on the M-Series screen than on the plastic. This is done by navigating to Settings > About smart glasses > Status and scrolling down until the serial number is displayed. From a computer, visit www.vuzix.com. Click “Vuzix App Store” from the homepage. Select “My Account” from the top of the App Store page. Select "My Devices" from the navigation bar on the left. If the serial number of your M-Series is not shown, click the "ADD NEW DEVICE" button, and follow the instructions. If the device serial number is already showing up under "My Devices", press the Refresh button (circular arrows) to allow the device to reconnect. If any errors occur during this process, please contact Technical Support. If you are familiar with ADB (Android Debug Bridge), using commands in that protocol is the simplest and most direct way of loading an application to the device via USB. You’ll need ADB to be installed (you can follow this tutorial), and then simply issue the command ‘adb install <filename>.apk’ from within the directory that contains the apk in a Command Prompt window. How can I navigate the M-Series Smart Glasses user interface? For ease of use, the M-Series Smart Glasses offer multiple modes of interaction, including buttons, touchpad, and voice commands. For details on M-Series Smart Glasses button behavior, refer to the M-Series Smart Glasses Quick Start Guide. The M-Series Smart Glasses touchpad offers two-axis navigation, with left/right and up/down gestures. To select with the touchpad , double-tap the touchpad surface. For the best experience when using the touchpad, it is best to use the full pad of your finger to make contact with the surface. For details on voice commands in the M-Series Smart Glasses, refer to the FAQ covering voice commands here. How do I attach a Telephoto Lens to my M-Series Smart Glasses? 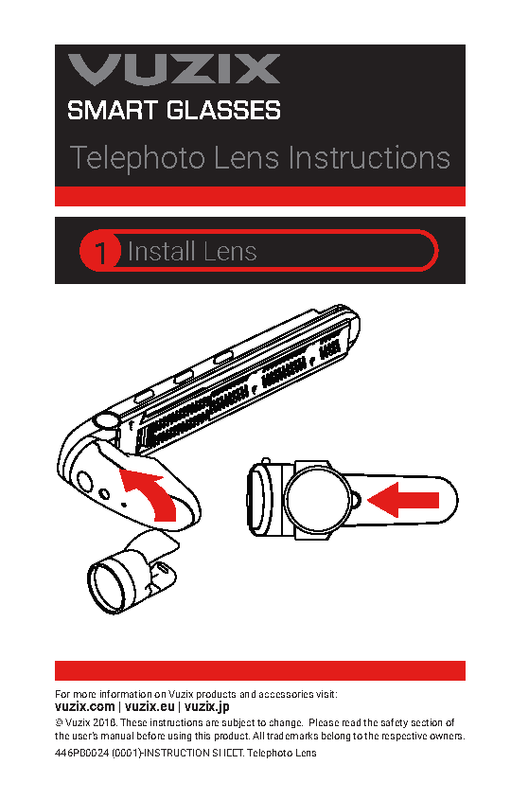 Slide the Telephoto Lens into your M-Series Smart Glasses until the lens is on top of the camera as shown in this image. How do I charge and connect my USB-A Battery? Your USB-A Battery has three ports. The one by itself at the rear of the battery is the USB port used to connect accessories. In the front there are two ports, the first one, closer to the LED lights, is where you should connect the battery's power cable to charge it, and the other you will use to connect the battery to your M-Series Smart Glasses. You can see your battery ports in this image. How do I use the Cable Clip with my M-Series Smart Glasses? The Cable Clip keeps your M-Series Smart Glasses firmly connected to your external battery so you can move freely and not lose power connection. For that, you simply need to connect your Cable Clip to the rear of your M-Series Smart Glasses like shown in this image. My M300XL is not recognized when I connect it to my PC through the on-frame battery pod. What can I do? In order to connect your M300XL to a PC, you must connect the USB cable directly to the main unit and not through the on-frame battery pod. The USB Micro-B port on the M300XL battery pod does not provide data pass-through to the main unit. How can I enable App Manager on my M-Series Smart Glasses? The App Manager is a service that allows your M-Series device to communicate with the Vuzix App Store, ensuring that any apps downloaded to your device stay up to date with the latest changes. To enable this service from your device, navigate to Settings > App Manager. 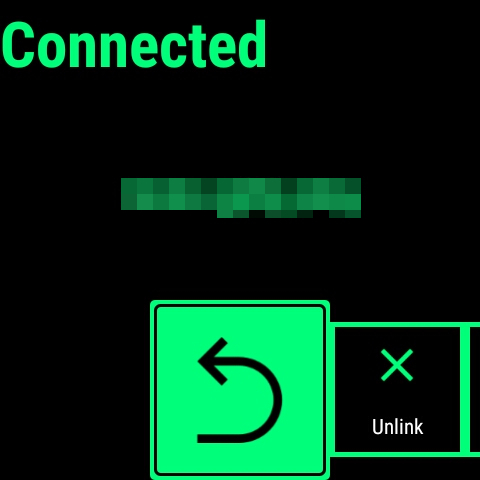 The App Manager toggle switch must be enabled in order for the service to properly communicate with the Vuzix App Store. Once the App Manager switch is toggled, it may fail with the error "App Store connection refused. Is this device properly registered on the app store?" The switch will again appear in the off position. To correct this, follow the "Linking to App Store Account" section below, then repeat this configuration section. Once enabling the App Manager switch is successful, please be sure the M-Series device is configured to "Run Actions Automatically" and to "Check for Updates Periodically". These settings will keep the device synchronized with the latest updates from the Vuzix App Store, preventing future problems. These two settings can be found directly under the App Manager toggle switch. Click "Check for Pending Actions Now" and the M-Series device will begin downloading and installing any applications that are out of date. To do this, determine the serial number of your M-Series device before continuing. The serial number is printed on the outside plastic of the M-Series device. Please be careful to read this from the main M-Series unit, not the battery. It may be easier to read the serial number on the M-Series screen than on the plastic. This is done by navigating to Settings > About smart glasses > Status and scrolling down until the serial number is displayed. How do I know which Telephoto Lens fits my Smart Glasses? The M300 has two possible eyepiece shapes. It is important to purchase the correct lens. Please reference this diagram for help identifying which version of this accessory will fit your device. How do I enable the M-Series WiFi adapter? To enable the USB WiFi adapter, please follow these instructions. Can I use voice commands to control the M-Series Smart Glasses? Yes, the M-Series Smart Glasses Speech Recognition engine includes a set of basic navigation and control commands by default. These commands are globally accessible on the M-Series Smart Glasses while the recognizer is enabled. To enable, go to Speech Recognition in the Settings application and toggle the “Enable Vuzix Speech Recognition” option. From this screen, you can also modify the sensitivity and timeout settings of the Speech Recognition engine. Sensitivity will adjust the amount of accuracy required by the recognizer when listening for a phrase, and timeout will adjust how long the recognizer will continue listening for commands after the keyword or the last voice command is issued. By default, the timeout is 15 seconds. Setting the timeout slider to the maximum value will set the timeout to an unlimited value, though it is important to keep in mind this will increase battery usage by the recognizer. To issue voice commands, you must first speak the “Hello Vuzix” keyword to trigger the listener which will remain active for the timeout duration. Issuing additional commands will reset this timeout. To see a list of the current set of stock voice commands and their functions please reference the Knowledge Base article here. How do I update Basics Video? Certain M-Series devices may be using outdated Basics Video application software. This may cause video calls to fail or may cause the call quality to suffer. The M-Series device is designed to automatically update applications using the Vuzix App Store. However, certain configurations may prevent this from working properly. To automatically update Basics Video, the M-Series device must check-in with the Vuzix App Store, and the Basics Video license must be linked to your account. This procedure will resolve most issues related to automatically updating Basics Video. Some customers purchased Basics Video in a kit consisting of an M-Series device pre-installed with Basics Video. These customers should follow the procedure in the printed “Getting Started Guide” to link the M-Series to an account on the Vuzix App Store. Customers who purchased Basics Video directly directly from the Vuzix App Store already have the license associated with your M-Series device, so this can be skipped. If you encounter problems during this procedure, please contact Technical Support to resolve this issue. 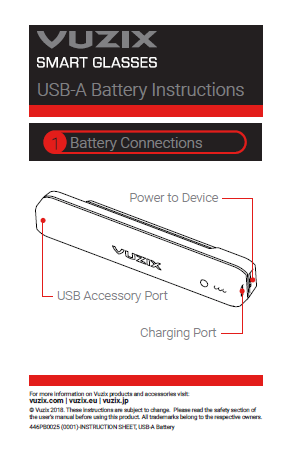 Many Vuzix App Store connection problems are caused by M-Series devices that do not have a Wi-Fi connection or do not have external internet access. If your device can establish a Basics Video call, you have already proven this is not the case and Wi-Fi troubleshooting is not required. However, customers with problems updating applications other than Basics Video should verify their external network connectivity before continuing. To verify your M-Series device can check-in with the Vuzix App Store and receive updates to apps automatically please follow the Device Configuration section found in this FAQ. Once your device is properly configured, and your App Store Account is linked, you should see a license for Basics Video associated with your device under the "My Apps" section of the "Vuzix App Store". If any errors occur during this process, or if the Basics Video license is not shown, please contact Technical Support. 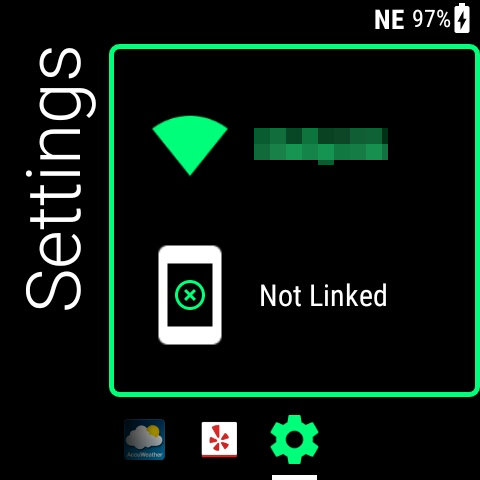 How can I connect my M-Series Smart Glasses to a WiFi network? For most users, the simplest way to connect the M-Series Smart Glasses to a WiFi network is by generating a QR code using your computer or smartphone and scanning it on your device. Vuzix provides a browser-based tool to generate such a QR code on https://www.vuzix.com/wifiQR. To maintain your security, this tool generates the QR code locally within your browser. The tool does not transmit your SSID or password to our servers. Once you have a QR code, open the Scanner application located on the M-Series Smart Glasses main launcher, scan the QR code, and click the "Connect To Network" button. If scanning a QR code does not meet your needs, you can manually view and connect to networks. Open the Settings application and then select Wi-Fi from the top of the list. Enable the WiFi by toggling Off to On. The device will then scan for available networks. Scroll down to the network you want to connect to and select it. A standard Android keyboard will come up if the network is password protected. Use this keyboard to enter the password. The touchpad and buttons can be used to navigate the keyboard. 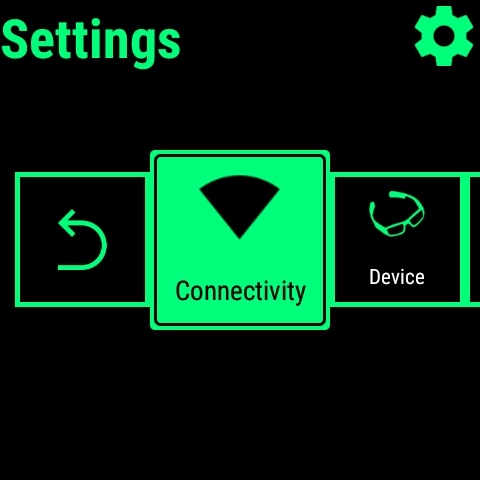 Advanced WiFi settings can be accessed from the context menu on the WiFi settings page, by long-pressing on the button closest to the M-Series Smart Glasses display and then selecting "Advanced" from the dropdown list. This will show you your WiFi MAC and IP address, as well as allow you to modify other advanced settings such as restricting the wireless to 5GHz WiFi bands. Can I use the Vuzix Smart Glasses Manager application with the M-Series Smart Glasses? No, SG Manager only supports the M100 at this time. There are a number of third-party applications which will allow for remote control of the M-Series Smart Glasses either via USB or WiFi. We have evaluated Vysor (USB and WiFi) and AirDroid (WiFi only). Both applications are developed by third parties and have some connectivity issues not unique to the M-Series Smart Glasses, but they do work. The M-Series Smart Glasses also support input from Bluetooth peripheral devices, including mice and keyboards. I’ve installed an application on my M-Series Smart Glasses but I am unable to control it. What can I do? The significant majority of Android applications are designed with touchscreen-based devices in mind. M-Series Smart Glasses use a very different user interface and interaction model compared to traditional Android phones and tablets, and rely heavily upon focus-based navigation for interface objects which most traditional Android applications do not implement. As such, we must consider most Android applications not designed with Smart Glass devices in mind as unsupported. It is possible to navigate these applications with external input devices such as a Bluetooth mouse/keyboard combination or remote control applications such as Vysor, but as the primary objective of using a device such as the M-Series Smart Glasses is to be able to work hands-free, these applications will provide a far less than ideal user experience. If there is an application which fits into this category that you must use on the M-Series Smart Glasses, it is highly advisable to contact the developer of the application to see if they would be willing to develop a separate version of their application which will be better suited for the user interface model of the M-Series Smart Glasses. My M-Series Smart Glasses are not being recognized by my PC when connected over USB. What can I do? On some systems, the M-Series Smart Glasses will require the Intel USB Driver for Android Devices to be installed. That driver can be downloaded here. Can I cast the screen of my M-Series Smart Glasses? Yes, the M-Series Smart Glasses support the Miracast streaming standard. 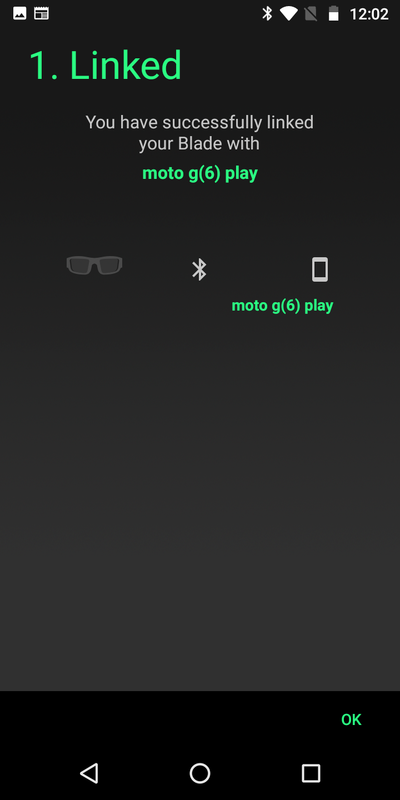 To cast your screen, go to the Display section of the M-Series Smart Glasses Settings application and select "Cast screen". 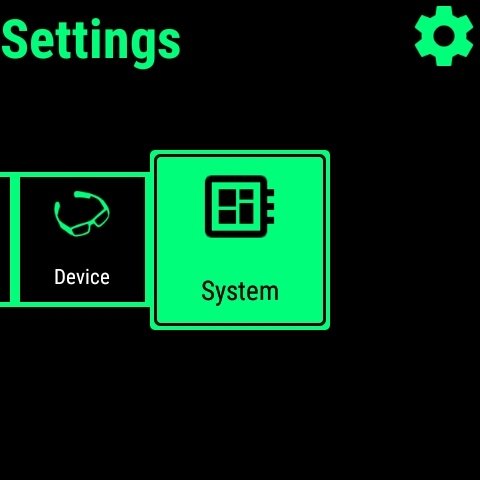 You will need to activate the “Enable wireless display” option which can be found in the context menu of this screen, which can be accessed with a long-press on the forward button closest to the display on the M-Series Smart Glasses. Once enabled, the M-Series Smart Glasses will scan for available Miracast devices and then allow you to cast your screen to a device you select. How can I extend the runtime of my M-Series Smart Glasses? To extend the runtime of your M-Series Smart Glasses, connect an external USB battery to the USB Micro-B port on the M-Series Battery Pod. Alternatively, you can use the optional M-Series Micro USB Power Adapter and connect the external USB battery directly to the M-Series Smart Glasses main unit. You can purchase additional external USB batteries and the optional USB power adapter for the M-Series Smart Glasses in our Accessory section here. Does the M-Series Smart Glasses support the Google Play Store? The M-Series Smart Glasses are not a CTS (Compatibility Test Suite) compliant device and does not support the Play Store or other Google Mobile Services (GMS) not covered by the Android Open Source license. 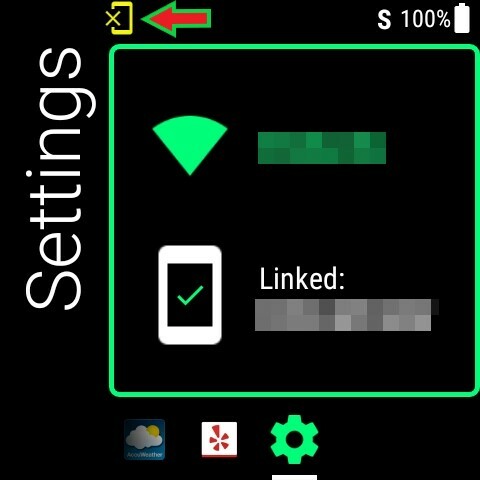 How can I manage the OTA (Over The Air) update notifications on my M-Series Smart Glasses? 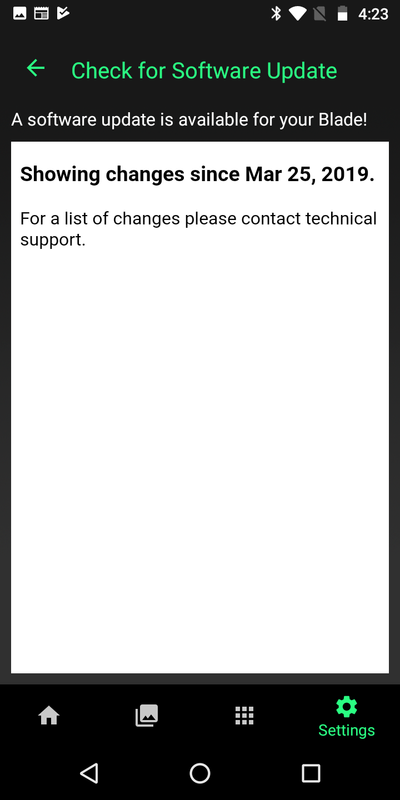 Disabled - This option will fully disable the notifications mechanism, preventing the M-Series Smart Glasses from proactively contacting our OTA server to check for updates. 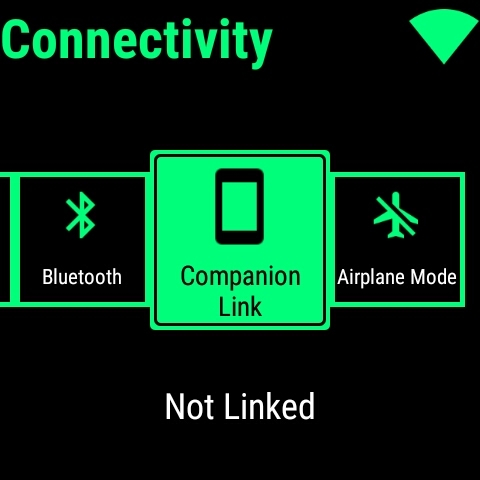 Notify Only - This option will check for updates any time the M-Series Smart Glasses are powered on and connected to a network with internet connectivity, and will only show a notification icon in the notification drawer. Notify and Alert Once - This option will check for updates any time the M-Series Smart Glasses are powered on and connected to a network with internet connectivity, and will show a notification icon in the notification drawer as well as displaying a pop-up notification to inform the user that an update is available. 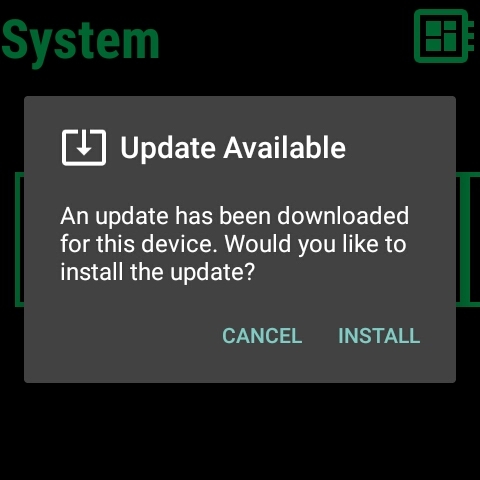 This pop-up has two options, to dismiss the notification or initiate an update. The pop-up notification will display only once per power cycle of the M-Series Smart Glasses. 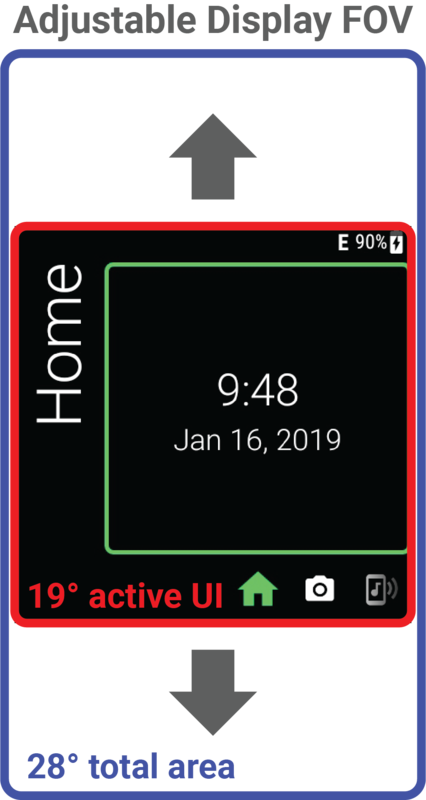 Notify and Alert Periodically - This option will function the same as the above, but will display the pop-up notification once per power cycle or once per every 12 hours, whichever comes first. How can I update the OS on my M-Series Smart Glasses? 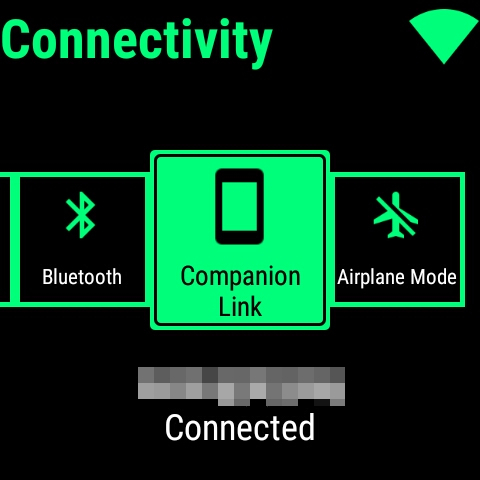 The preferred method of updating your M-Series Smart Glasses is via the included OTA (Over The Air) update mechanism, which will require the M-Series Smart Glasses to be connected to a stable WiFi network with internet access. Make sure your M-Series Smart Glasses are plugged into a 1.5 amp USB power source*. Select the "OTA System Update" option at the bottom of the list. Select the "Check Server for Updates" option. If an update is available, select "Install". Wait for the M-Series Smart Glasses to download, then reboot and install the update. Once the M-Series Smart Glasses have fully rebooted following the update, your update is complete. *Do not power off or interrupt the M-Series Smart Glasses during the upgrade process or corruption of the OS may occur! If your OS is corrupted, contact Vuzix Technical Support for assistance. As an alternative, the M-Series Smart Glasses can be updated offline via USB with Platform Flash Tool Lite from Intel. For assistance with manually updating your device with this tool, please contact Vuzix Technical Support. I’m having trouble powering on my M-Series Smart Glasses. What can I do? This is likely an issue with the level of charge on the batteries in your M-Series Smart Glasses. The M-Series Smart Glasses contain two batteries, the primary battery within the M-Series Battery Pod, as well as a small fail-over battery in the M-Series Smart Glasses main unit to support the hot-swapping functionality of the Battery Pod. If the internal fail-over battery does not have sufficient charge, the M-Series Smart Glasses will not boot. It is important that prior to first use, the M-Series Smart Glasses are charged, fully assembled, and connected to a power source supplying a minimum of 1.5A. 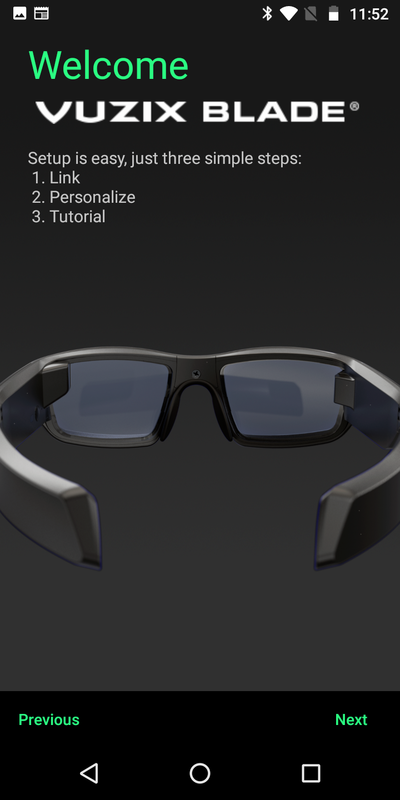 When not using your M-Series Smart Glasses, it is important to disconnect the battery from the main unit and ensure that the unit is powered down by holding the power button for a few seconds and then selecting power off from the pop-up menu and then confirm by selecting “OK”. The internal battery should not drain, and you can simply charge the battery pod alone from a power source supplying a minimum of 0.5A. If you are still having trouble, please contact Vuzix Technical Support. How can I transfer files to/from the M-Series Smart Glasses? 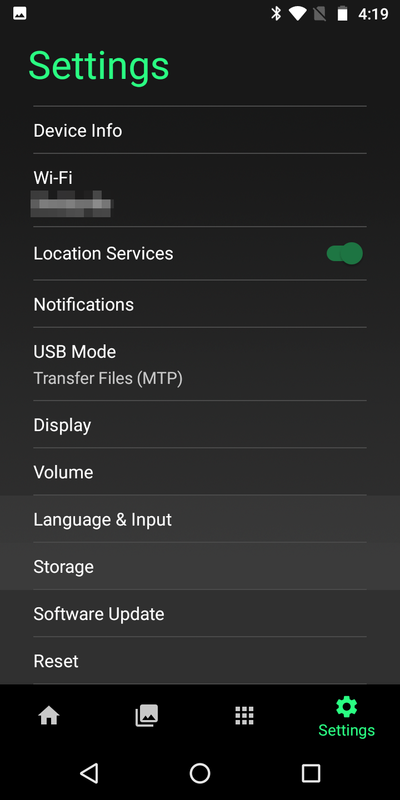 In order to transfer files from the M-Series Smart Glasses via USB, you will first need to change the USB mode in Settings to MTP (Media Transfer Protocol) mode. This can be accessed in Settings under Storage & USB, then with a long press on the forward button closest to the display to bring up the context menu. From there, select USB mode and choose the mode for ‘File transfers’ to enable MTP mode. Once enabled, you will be able to navigate the filesystem on the M-Series Smart Glasses when plugged into a PC via USB as a standard USB storage device. Please note that MTP mode will remain enabled only during the current USB session. If you disconnect the M-Series Smart Glasses from your PC or reboot the device, you will need to re-enable MTP mode. This is by design and is standard Android behavior for security reasons. I need prescription glasses. Can I wear the M-Series Smart Glasses? Yes, we have a number of options for those who require prescription eyewear. By default, the M-Series Smart Glasses ship with our lens-less frames which are designed to fit over the majority of eyeglass frames. In addition, the safety frames included with the M-Series Safety Frame Kit can be taken to most optometrists and have the prescription added. How can I stream video from the M-Series Smart Glasses to a remote party? The M-Series Smart Glasses support the Basics Video application for "see what I see" video calling. Many of our VIP partners also offer software solutions which support video streaming. Android applications such as Skype may install and run on the M-Series Smart Glasses, however, they do not have user interfaces optimized for the M-Series Smart Glasses and will require external input to control, such as Bluetooth mice/keyboards or a remote control application such as those referenced in the Smart Glass Manager FAQ above. How can I develop an application for the M-Series Smart Glasses? For information on developing applications intended to run on the M-Series Smart Glasses, please register as a developer on our site and reference the M-Series Smart Glasses SDK documentation. If you have any questions relating to development on the M-Series Smart Glasses, please contact Vuzix Technical Support. How can I install applications to my M100? If the application you wish to install is on our App Store, log in to the app store and register your device. From there, any of the application that you add to your app store library	will be installed to your M100 once it has an internet connection. To enable OTA, go to the App Manager in the Setting application and enable it. You can also, from this menu, select the method the M100 will choose to determine when it updates going forward. You can use our Smart Glasses System File Manager to load APKs directly to the M100. You can download and install System File Manager from here. You can also load applications directly to the filesystem of the M100 either by downloading from a URL linking directly to the application, or via USB (to the Download directory). You can then install the APK from the Downloads application on the M100. You will need to enable the installation of applications from unknown sources to do this. To do so, go to the Security area in the Settings application and enable the “Unknown sources” option. What can I use the USB micro-B connector for? This connector can be used only for charging and ADB (Android Debug Bridge) connectivity. This port does not support an MHL (Mobile Hi-Speed Link) connection or USB peripherals. What are the options for screencasting from the M100? Screencasting is not officially supported in the current version of Android (4.0.4 – Ice Cream Sandwich) being used on the M100. The best option which exists today is utilizing ADB over the built in USB micro port and an application such as Droid@Screen. Are Google push notifications supported? We do not currently support Google Cloud Messaging. Any push notifications would need to be provided by a third party application. We do not currently support Google APIs or services. Any application depending on these services will result in an error when launching the application on the M100. Is it possible to add additional voice commands? Yes, additional grammars can be added to our voice engine for a cost – [cost] per grammar. Vuzix will create the additional grammars for you which can then be installed on the device. It is not possible for end users to add additional grammars independently. The Vuzix Basics™ Video / M300 Package is a limited time offer with everything you need to jump start your smart glasses pilot/project right out-of-the-box. Just Click, Connect, and Collaborate! This Package includes a 1 year Vuzix Basics™ Video software license, a standard M300 Kit (main unit, on-frame battery, lens-less frames, power cable, charging cable, ear hooks, carrying case, and 1 year warranty). This package also includes a set of Vuzix’ most popular industrial accessories: Additional On-Frame Battery, Micro USB External Power Adaptor, Vuzix belt mounted 10,050mA external battery, a spare power cable, and Headband mounting option, plus all associated quick start guides. ALL OF THIS FOR 20% OFF RETAIL PRICE. What browsers are supported with Vuzix Basics™ Video for the web interface? The web interface supports the Chrome and Firefox web browsers. What are the bandwidth requirements for a good experience with Vuzix Basics™ Video? There is no minimum bandwidth requirement, however the resolution and framerate of the video stream will be dependent upon available bandwidth. A broadband or equivalent connection is highly recommended for the best experience with Vuzix Basics™ Video. I’m not able to see my video stream or hear any audio on my calls. What can I do? You’ll need to make sure the appropriate permissions are enabled for the Vuzix Basics™ Video application. To do so, go into Settings > Apps > Permissions and make sure that the permissions for Camera and Microphone are enabled. I’m having trouble powering on the M300. What can I do? This is likely an issue with the level of charge on the batteries in your M300. The M300 contains two batteries, the primary battery within the M300 Battery Pod, as well as a small fail-over battery in the M300 Main Unit to support the hot-swapping functionality of the Battery Pod. If the internal fail-over battery does not have sufficient charge, the M300 will not boot. It is important that prior to first use, the M300 is charged fully assembled and with a power source supplying a minimum of 1.5A. When not using your M300, it is important to disconnect the battery from main unit and ensure that the unit is powered down by holding the power button for a few seconds and then selecting power off from the menu and then confirm by selecting “OK”. The internal battery should not drain, and you can simply charge the battery pod alone from a power source supplying a minimum of 0.5A. I performed a Factory Reset on my M300 or uninstalled the Vuzix Basics™ Video application. How can I reinstall it? Please contact Vuzix Technical Support and our team can assist you with the reinstallation. Is the video stream with Vuzix Basics™ Video secure? If so, how? The solution meets stringent application level standards with TLS, SRTP, H.235, and AES 256-bit encryption. At the network level, our hosting facilities are SOC 2 & HIPAA compliant. We have leading edge filtering & advanced routing techniques protect against Distributed Denial of Service (DDoS) attacks. I already own an M300. Can I purchase the Vuzix Basics™ Video software separately and install it to my device? Yes, Vuzix Basics Video is available on the Vuzix App Store (https://www.vuzix.com/appstore/app/vuzix-basics-video). A full-featured 30-day trial is also available (https://www.vuzix.com/appstore/app/vuzix-basics-app-trial). 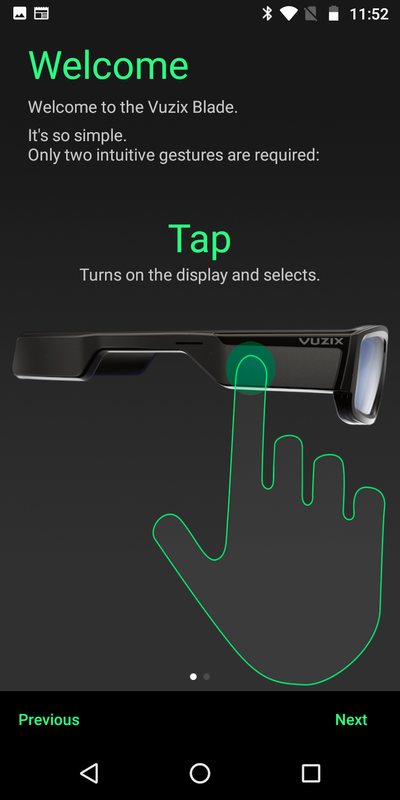 Vuzix Blade is the world's first augmented reality smart glasses with Wave-Guide technology. How can I navigate the Blade user interface? The Blade has one physical button which is the power button. This button can be used to power ON and power OFF the Blade. It also has a touchpad on the right temple. All the interactions with the Blade are done using this touchpad as gestures. For details on Blade gestures, refer to the Blade Quick Start Guide. The Blade has two LEDs. The green power LED is the visual indicator that the Blade is powered ON or if the Blade is being charged. The red recording LED is the visual indicator that the camera app is being accessed or a video is being recorded by the Blade. What Connectivity features does Blade provide? The Blade provides USB connectivity for development, MTP/PTP for media transfer(Pictures/Videos). Blade also provides Wi-Fi and Bluetooth for wireless connectivity. What Wi-Fi bands does Blade support? The Blade can connect to any Wi-Fi that provides the 802.11b/g/n 2.4GHz Wi-Fi bands. What is maximum SD-Card size supported on Blade? The Blade is compatible with any size Micro-SD Cards as long as they are formatted as FAT32. What are the camera specifications on Blade? Blade camera is 8MP camera with 720p 30fps or 1080p 24fps video recording capabilities. How can I transfer files to/from the Blade? To transfer files from the Blade via USB, you will first need to change the USB mode in Settings to MTP (Media Transfer Protocol) or PTP (Picture Transfer Protocol) mode. This can be accessed in Settings under USB Mode. Once enabled, you will be able to navigate the filesystem on the Blade when plugged into a PC via USB as a standard USB storage device. Where can I download the Companion App? You can download the Companion App right now for iPhone in the Apple App Store, or you can download the Companion App for Android in the Google Play Store. Why don't my pictures/videos show up in my companion app? How large is the Blade's display? The Blade's display is currently configured as a 480x480p square which occupies 19 degrees of the right eye field of view (FOV). This square display can be positioned anywhere in the 28 degree vertical Waveguide on the device. How can I link my Blade to the Companion app? The Companion App is available for your Vuzix Blade and it can be installed on your iOS or Android smartphones. The Companion App enables easy setup and customization of your Blade and manages the communication link between the Blade and your smart phone. It also has features like photo transfer, configuring the settings and installing applications. iOS, visit the Apple App Store. Android, visit the Google Play. Once you install the Companion app on your smartphone, follow the below steps to connect your Blade with the installed Companion app. Start the Companion app on your smartphone. Hit 'Start Setup' to start link procedure. Agree to the Vuzix Terms of Service. The Welcome screen explains the steps involved in the setup process. Hit Next. The next screens explains the basic gestures available on your Blade. When comfortable hit Next to the link screen. The link screen show the QR-Code using which you can link to the Blade. On your Blade navigate to the Settings > Connectivity and tap on Companion Link. If Bluetooth on Blade is disabled, notice 'Bluetooth Required' screen. On that screen swipe and tap Yes. 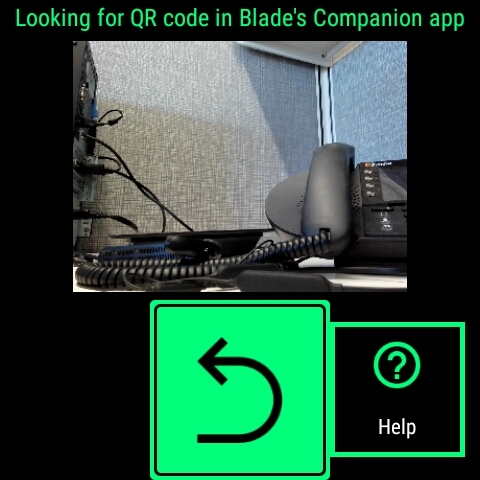 Notice the Camera gets turned on with message 'Looking for QR code in Blade's Companion app'. Now you will be able to scan the QR-Code on the smartphone. 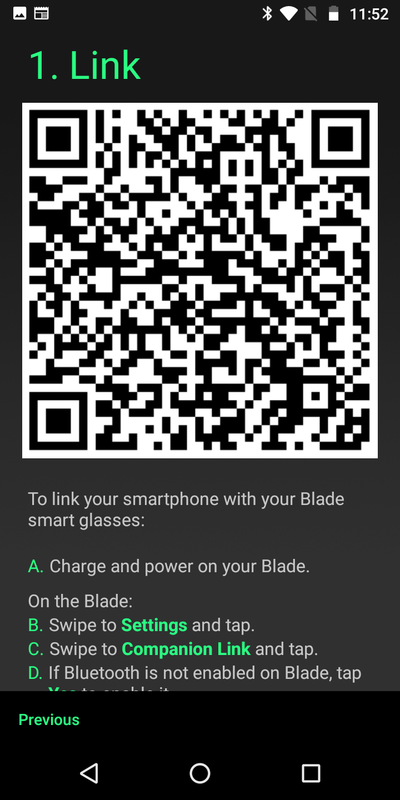 Once the QR-Code code is scanned, the Blade will verify the link and show a status 'Linked' on both your smartphone and 'Connected' on your Blade. Click on on the smartphone. The next step is to personalize. You can name your Blade, for example 'Joe's Blade'. This new name will be your Blade's Bluetooth Name. Hit Next when done. 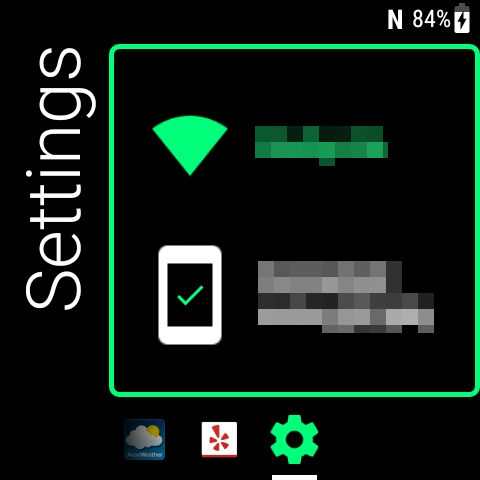 Next step is to customize the notifications that show up on your Blade. Enable or disable any app's notification by toggling the buttons. Hit Next when done. Finally, the tutorial explains the more advance gestures on Blade. 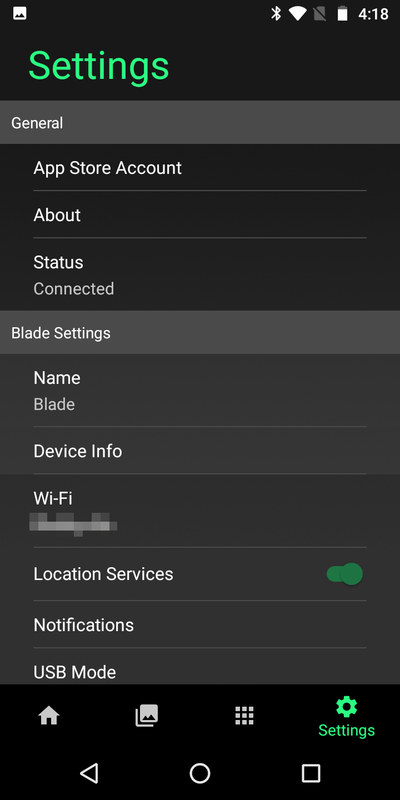 If your smartphone or Blade are not in range (or Bluetooth is off or Airplane mode is on) you will see a disconnect icon on your Blade and a disconnect message on your Companion app. When both devices come in range (or Bluetooth is on) they automatically are connected. Also see the video to understand the process better. How can I perform a software update on the Blade? The Blade has the ability to perform a Software update over-the-air (OTA). Note that the Software update or OS update will not remove or erase any of your personal data like photos, videos, settings and apps. 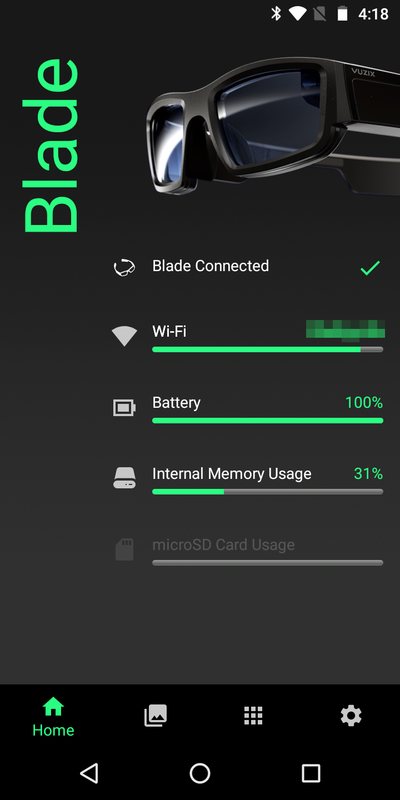 To perform a software update on your Blade you will need the Blade to be connected to the internet (Wi-Fi) and the Blade's battery should be above 50%. 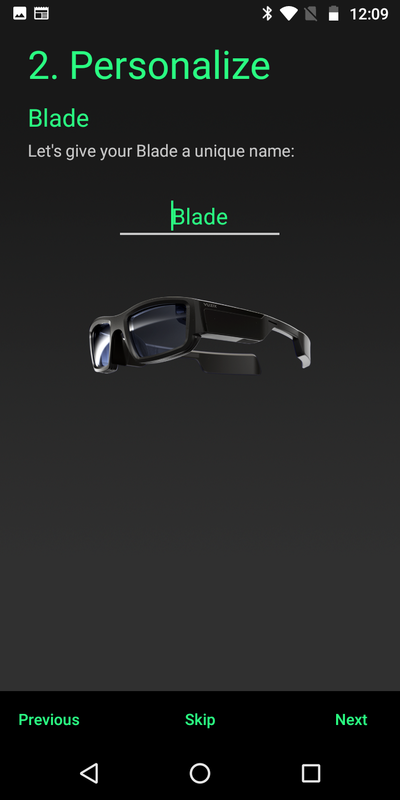 Have your Blade connected to the Companion app on your smartphone. Click on Settings tab, scroll down and click on the "Software Update" option. Clicking on 'Check for Software Update' will check if there is a new Software version available. If no updates notice 'Your Blade software is up to date' and if there are updates a status message will show up with release notes. Not that you currently cannot initiate the Software update of Blade from Companion app. You will have to follow the below steps to update the Software on Blade. On your Blade, swipe and tap on Settings, later swipe and tap on System and finally swipe and tap on Software Update. Clicking on 'Check for updates' option will check if there is a new Software version available. If there are not updates you will see a toast saying the same. But if there are updates, you will see a dialog saying new updates are available for your Blade. 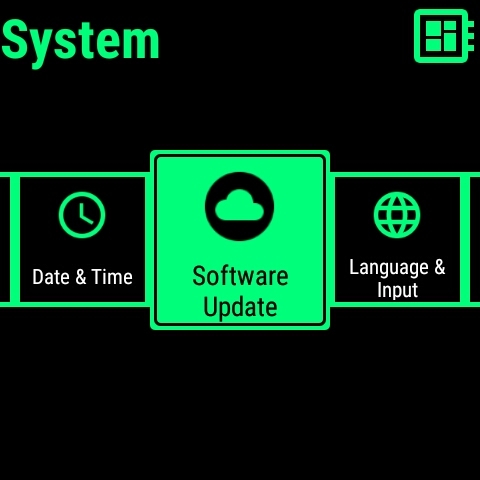 The dialogs will guide your through the process of Downloading the Software Update, Verifying it and later installing. Blade will reboot after the install. Vuzix Blade, the world's first augmented reality smart glasses with Wave-Guide technology, is compatible with prescription lenses. Can I place an order for Blade and provide the prescription information later? Once you have your prescription information, go to My Account and find the order number to which you want to add prescription information. 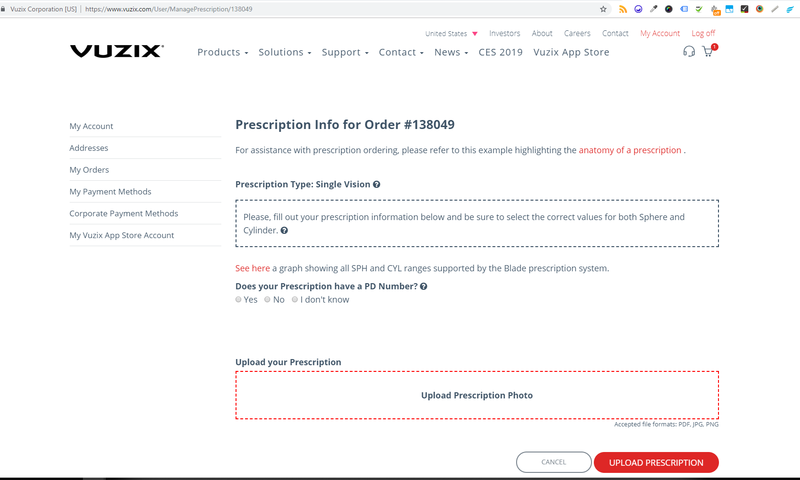 Click on the Manage Prescription link for that order. The Manage Prescription page will look like this image. Here you can add your prescription information. Click UPLOAD PRESCRIPTION button once done. Note that the order will be processed only after the prescription information is updated. My prescription doesn't have a PD. How can I measure my PD? To measure your PD please see our PD measuring guide. Can I return my prescription inserts? Vuzix does not accept returns of the Blade prescription inserts. How can I order a Blade with prescription inserts? Please check our prescriptions manual here. Will the Blade and prescription inserts be shipped together? The order will be delivered in two parts. The first shipment will include the Vuzix Blade Smart Glasses. The second shipment will include the prescription lenses and instructions on how to install them. How do I install new prescription lenses on my Blade? To learn how to install your new prescription lenses on your Blade, please visit the Prescription Lens Installation Guide page. You can also download the installation guide PDF by clicking here. iWear® video headphones comes with dual high-definition displays that supports HDMI inputs compatible with mobile phones, tablet devices, console systems, PCs, and 3D Blu-ray players. iWear includes a carrying pouch, immersive light-shield, AC charging adaptor, Quickstart, warranty and safety instructions. A full manual is available by digital download. Is the iWear® a Virtual Reality only device like the competitive goggle worn systems? The iWear® was designed to be an entertainment device not only for gaming but also for compatibility with most of the standard content available today. That means it’s out of the box ready to play. It also makes a great Virtual Reality device. The high resolution, lack of screen-door effect and integrated tracking all make the iWear® great for VR. The 57 degrees, with as much as 4 times the pixel density of today’s competing solutions, looks outstanding and feels like a total immersive view. What content can be used with the iWear®? The content is endless provided the video comes in HDMI. The iWear® is completely media agnostic, meaning it can display content from any smartphone, TV, gaming console, tablet, etc. And it supports stereoscopic 3D in any of the modes that are HDMI compatible! There is a hardware button for forcing 3D mode, but most forms will be automatically detected and display in 3D without any effort on your part. Can I watch 3D Blu-ray movies? Yes, you can watch any 3D Blu-ray movie in full frame-packed HD video for the best flicker-free viewing experience. Can I use the iWear® with my Windows PC or Mac as a secondary display? Yes, you can enjoy full-screen readable across a massive screen. And with the iWear’s optics it should be highly readable even into the corners of the display. Can I view 3D immersive content compatible with other immersive VR goggles? Yes, there are a variety of sources with numerous titles and content coming out daily. With OSVR compatibility, as new titles are released they should automatically support the iWear’s VR capabilities. Can I use the iWear® with my Xbox or PlayStation? Yes, you can play intense gaming on a massive video screen that will vastly outsize your other home based video screens. Can I use the iWear® with my iPhone or Android based smartphone? Yes, just get an HDMI cable that’s compatible with your smartphone and you’ll be in the theater’s front row! Even 3D content can play off your smartphone. And of course your games will look absolutely awesome and will rival your home console gaming experience. Can I use a WiFi HDMI dongle with the iWear® to receive and watch wireless video from a tablet, smartphone or PC? Yes, with appropriate cabling. And the experience is awesome! How does the iWear® compare to standard professional audio headphones? The iWear® is well balanced and very comfortable for those long gaming sessions. Vuzix used high quality materials for maximum touch / feel and numerous adjustments allow for a very comfortable fit. The leather surfaces with plenty of foam packing provide a comfortable natural feel. The iWear® was also designed to provide a visual experience that would support many hours of comfortable use. The video visor floats in front of your eyes not touching the front of your face or your nose putting practically zero pressure on your face. The optics are one size fits all, requiring no focus or IPD adjustments, and they can also be worn above virtually all glasses. The iWear® was designed with no mechanical features on the back of the head. This allows the iWear® to be used in environments where you may want to put your head back and relax – like in your bedroom or while travelling on a plane. How portable is the iWear®? The iWear® was designed to fold up and fit in a small carry case and since it runs on batteries it doesn’t need to be plugged into the wall to use. These features are critical for a mobile device. What is the field of view? Looking into the device, you’ll see an image that looks like a 130” screen 10 feet away from you. That translates to a 57 degree diagonal field of view. One million high definition color pixels / eye. Will I need to wear my eyeglasses? Most people will not if you can see distance images clearly. However if you need eyeglasses to correct for distance vision, you can comfortably wear them under the unit.